The DC Control Pad is a third-party controller released for the Sega Dreamcast. 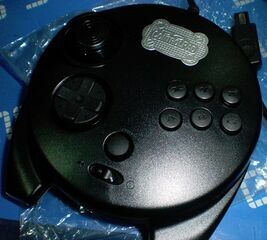 The DC Control Pad is unusual in that it is essentially a refitted Sega Saturn 3D Control Pad with minimal modifications - a pad which the official Dreamcast controller is known to have derived from. Due to the way the 3D Control Pad is designed, the back section, detachable for easier storage, may be the only element of this controller to see a significant change - this product potentially holds the key to transform any 3D Control Pad official or otherwise into something compatible with the Sega Dreamcast. The recycled design of the DC Control Pad gives it one key disadvantage - it is not compatible with peripherals such as VMUs or Jump Packs.